باقری آشنا, زهرا, ابراهیم زاده اردستانی, وحید. (1393). برآورد عمق بی‌هنجاری‌های گرانی حاصل از شکل‌های هندسی منظم با استفاده از تبدیل هیلبرت تغییریافته. مجله ژئوفیزیک ایران, 8(2), 70-80. زهرا باقری آشنا; وحید ابراهیم زاده اردستانی. "برآورد عمق بی‌هنجاری‌های گرانی حاصل از شکل‌های هندسی منظم با استفاده از تبدیل هیلبرت تغییریافته". مجله ژئوفیزیک ایران, 8, 2, 1393, 70-80. باقری آشنا, زهرا, ابراهیم زاده اردستانی, وحید. (1393). 'برآورد عمق بی‌هنجاری‌های گرانی حاصل از شکل‌های هندسی منظم با استفاده از تبدیل هیلبرت تغییریافته', مجله ژئوفیزیک ایران, 8(2), pp. 70-80. باقری آشنا, زهرا, ابراهیم زاده اردستانی, وحید. برآورد عمق بی‌هنجاری‌های گرانی حاصل از شکل‌های هندسی منظم با استفاده از تبدیل هیلبرت تغییریافته. 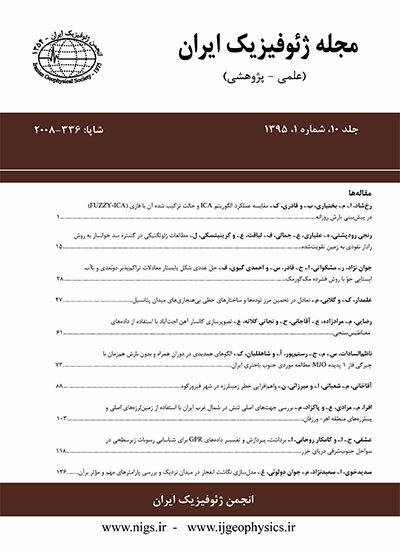 مجله ژئوفیزیک ایران, 1393; 8(2): 70-80. برآورد عمق بی‌هنجاری‌‌‌های گرانییکی از مهم‌ترین مراحل در تفسیرداده‌های گرانی‌سنجی است. ازاین‌رو در این تحقیق روشی برای برآورد عمق بی‌هنجاری‌ها با استفاده از روش تبدیل هیلبرت تغییریافته عرضه می‌شود. تبدیل هیلبرت، یک عملگر خطی است که فاز تابع را در بسامدهای مثبت به اندازه 90 درجه اضافه و در بسامدهای منفی به اندازه 90 درجه کاهش می‌دهد، درحالی‌که دامنه تابع تغییر نمی‌کند. تبدیل هیلبرت تغییریافته مشابه تبدیل هیلبرت است با این تفاوت که تبدیل هیلبرت تغییریافته اختلاف فازی برابر با 270 درجه ایجاد می‌کند، درحالی‌که در سایر ویژگی‌ها مشابه‌اند. در این مقاله، تبدیل هیلبرت تغییریافته تابع گرانی شکل‌های هندسی منظم محاسبه می‌شود. با طراحی دو مدل مصنوعی استوانه افقی و کره، نتایج در دو وضعیت بدون نوفه و با اِعمال نوفه تصادفی برای عمق‌های متفاوت از کم تا زیاد مورد بررسی قرار می‌گیرد. در مورد کاربرد تبدیل هیلبرت تغییریافته روی داده‌های واقعی به برآورد عمق داده‌های واقعی مربوط به دو منطقه آباده و هواسان پرداخته می‌شود و سپس عمق‌های به‌دست آمده با استفاده از روش تبدیل هیلبرت تغییریافته با نتایج حاصل از روش واهمامیخت اویلر مقایسه می‌شوند. One of the most important parameters in the interpretation of gravity data is the depth to the center or top of the buried body. In this study, the interpretation of gravity anomalies of spherical and cylindrical models is examined using the modified Hilbert transform. RF(ω) and FI(ω) are the real and imaginary component of the Fourier transform of f(x). The Hilbert transform defined by Eq. (1) is a mathematical operation which shifts the phase of a function by 90° without changing its amplitude. where q is shape factor and depends on the nature of the source, and is 3/2, for a sphere and 1, for a horizontal cylinder. And A is amplitude factor given by: , for a sphere and for a horizontal cylinder, where ρ is the density contrast, G is the universal gravitational contrast and R is the radius. The application of the method is examined using noise free and noise corrupted synthetic gravity data created for spherical and cylindrical models with a density contrast of 1 and 1.5g/cm3 respectively. The gravity anomaly g(x), modified Hilbert transform MH(x), along a profile at an interval of 1m are computed for both data sets. The procedure has been tested for several models at different dephts and radii, for three of which the results are presented here. It is observed that the depth to the origin of the gravity anomaly can be computed as a function of the intersection point of gravity anomaly g(x) and its modified Hilbert transform MH(x). The effect of random noise on the models shows that even by including up to 16% random noise, interpretational values do not differ significantly from thoes of the noise free case. Hence the effect of noise is negligible on the procedure. To illustrate the applicability of the method two field examples from “Abade” in Fars province and “Havasan” in Ilam province, Iran, are also included. A Scintrex CG3 gravimeter with a sensitivity of 5 microGal was used for micro-gravity observations in the selected areas. Station altitudes were measured with a total station model Leica Tc 407 with an accuracy of 1-5mm in horizontal and vertical coordinates. The residual gravity grids of were obtained obtained using Geosoft software. To demonstrate the reliability of the proposed method, the Euler de-convolution method is used to detect the depth of the real gravity anomalies. The results from the interpretation of real data by modified Hilbert transform method are compared to the ones obtained from the Euler de-convolution method and the known depth values from drilling information. Al-Garni Mansour, A., Sirinvas, Y., and Sundararajan N., 2009, Sundararajan transform– An application to geophysical data analysis: Arab J Geosci, 3, 27-32. Mohan, N. L., Sundararajan, N., and Seshagiri Rao, S. V., 1982, Interpretation of some two dimentional bodies using the Hilbert transform: Geophysics, 47(3), 376-387. Nabighian, MN., 1972, The analytical signal of two dimentional magnetic bodies with polygonal cross section, its properties and use for automated anomaly interpretation: Geophysics, 37, 507-512. Sundararajan, N., 1996, A modified Hilbert transform and its application to self­-potential interpretation: Journal of Applied Geophysics, 36, 137-143. Sundararajan, N., Sirinvas, Y., Laxminarayana and Rao, T., 2000, Sundararajan transform– A tool to interpret potential field anomalies: Exploration Geophysics, 31, 622-628. Sundararajan, N., Mohan, N. L., and Seshagiri Rao, S. V., 1983, Gravity interpretation of 2-D fault structures using the Hilbert transform: Journal of Geophysics, 34, 34-47. Sundararajan, N., and Narasimha Chary, M., 1993, Direct interpretation of SP anomalies due to spherical structures – A Hilbert transform technique: Gheophys. Trans, 38, 151-165.